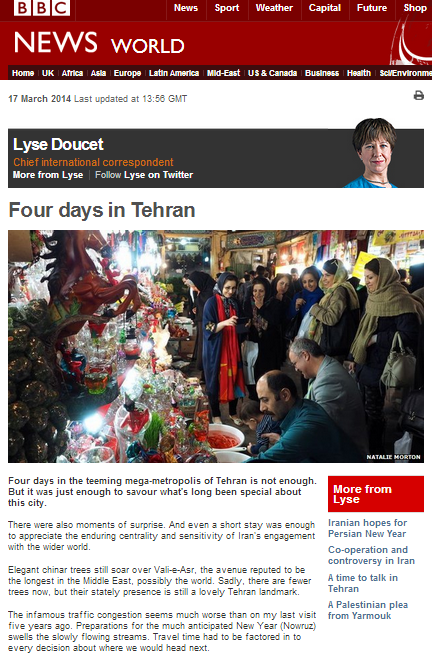 The BBC’s chief international correspondent Lyse Doucet recently accompanied the EU’s Catherine Ashton on a visit to Tehran and following that trip produced an article titled “Four days in Tehran” which appeared in the Features & Analysis section of the BBC News website’s Middle East page on March 17th. “The bazaars are bustling, and in places, bursting full of people and goods for sale. But many people lamented the high prices caused by sanctions. In some cases, they’ve tripled. Cheaper versions can be found on sale. And there is another aspect to the shortage of medicines story too. “Marzieh Vahid Dastjerdi, Ahmadinejad’s health minister at the time, was not saying what the Western media were regurgitating, she kept publicly complaining that the $2 Billion in the annual budget, allocated to import medicine with, was not received by the health ministry. It was a bizarre situation in which, Iran’s health minister kept repeating the medicine shortage was nothing to do with sanction and yet the Western media kept repeating, sanctions were causing the medicine shortage in Iran! But cranes are not only used to build new apartments in Iran; another much more sinister use has been found for them too. In 2012 the Iran Human Rights Documentation Center reports that 522 people were executed in Iran. According to the United Nations Special Rapporteur for Human Rights in Iran, 670 people were executed in Iran in 2011. In Iran, offenses that carry the death penalty include homosexuality, adultery, and “enmity against God.” Fair trials for these offenses are unheard of. A significant number of victims are publicly hanged from a construction crane, which is an especially slow and painful method of execution. Quite how Doucet’s assertion that Rouhani’s government is taking “the lead on human rights issues” can claim to square up with the facts is unclear. Nearly two hundred people have been executed in Iran since the beginning of 2014 alone according to the Iran Human Rights Documentation Center and some 600 executions have taken place since Rouhani’s watch commenced at the beginning of August 2013. 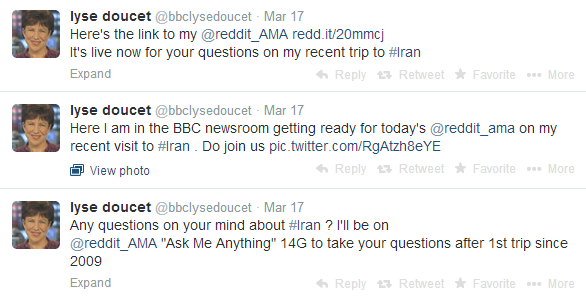 Also on March 17th Doucet hosted an “ask me anything” session relating to her recent trip on Reddit. The UN Secretary General’s March 2014 report on the situation of human rights in Iran is somewhat less enthusiastic than Doucet with regard to “advances” in women’s rights. Now, what is it again that the BBC purpose remit promises audiences? Iran is a beautiful country and Iranians are lovely people, despite their leaders. Do not listen to extremist war-mongrels who to drag you into another useless war. Iran has been sponsoring terrorists to murder our people for decades. If we are not at war, it’s because our response has been criminally restrained.